Happy 2018 – it’s been a WHILE since I’ve posted! And I’ll be honest with you guys. This is pretty much a gratuitous post about how much I loved travelling through Italy, with a little bit of Blackwood Sweater thrown in for good measure. I’ve blogged a bit more about the construction and details of this Blackwood Cardigan previously, so I don’t plan to go quite as in depth here. But if you’re into some pretty travel photos paired with handmade clothing, I’ve got you covered today! Italy has been a dream of mine for as long as I can remember. The food, the wine, the architecture, the art, the history – there are just so many incredible things happening there. When I finally had the opportunity to go this past November, I was ecstatic. I had high expectations, but Italia did not let me down. 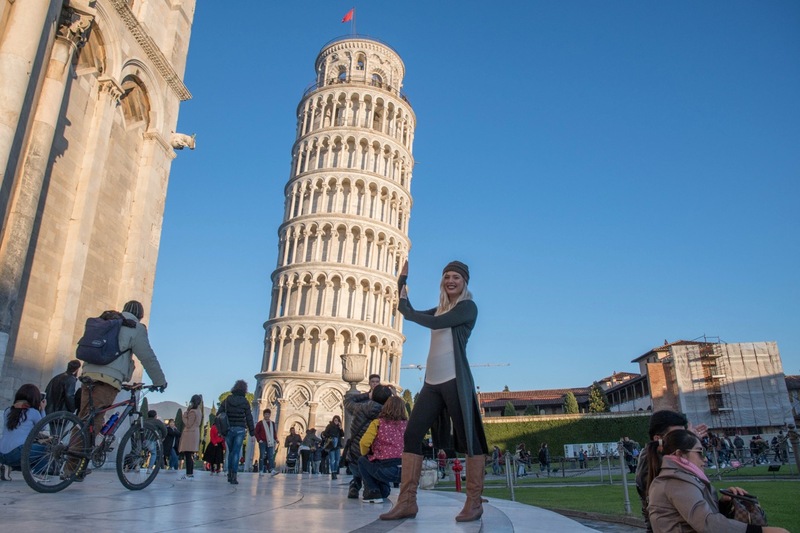 couldn’t leave Pisa without doing my part to hold up the Leaning Tower! In the month or so before we left, I spent a lot of time planning, researching, and reading travel blogs. I am prone to over-plan and over-book vacations, and I’d agreed to ease up on this and meet my very spontaneous husband somewhere in the middle of our very different planning styles. I worked up a plan of what general area we would want to be in each day, as well as some loose ideas of things that we might enjoy seeing. The week before we left, my husband and I sat down together and booked some AirBNB apartments for the first half of our trip, as well as a half-day wine tour about halfway through the trip. Aside from that, we left it all up in the air. As we were travelling during low season, we knew that lines would be shorter, and crowds would be smaller, and this eased my anxiety significantly. I wanted to go along with our relaxed, play it by ear dream vacation, but the planner in me needed to be let out… so to ease my checklist driven mind, I dove head first into blogs about how to pack for a winter vacation in Italy (though this seems specific, I was able to hunt down a number of good resources!). layered with an Ogden came for a warmer day in Amalfi. Packing light(-ish) was a priority for me, as we’d be doing a lot of traveling throughout the country, and my bags needed to be light enough for me to be able to lift and lug behind me frequently. Based on my readings, I decided that for our 3-week trip, I’d plan to bring 5 outfits and 2 pairs of shoes – I went with a pair of Keds for heavier walking days, and my cognac “leather” boots for lighter walking days / nicer dinners (Sidenote, the soles and heels of the boots are absolutely dead now, and are begging to be retired after accidentally being picked for some VERY heavy walking days!). I really wanted to bring some handmade pieces with me, so I chose two of my trusty ready to wear sweaters, my crimson Toaster Sweater, my camel colored wool vest, and my Blackwood cardigan. I packed 2 pairs of leggings, 1 pair of jeans, two thermal undershirts, an Ogden cami (for layering! ), and of course the other necessities – socks, undies, the usual. 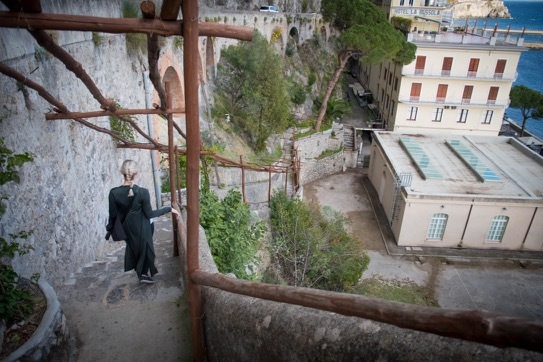 My typical uniform was a pair of leggings and an undershirt, one of the sweaters, and either my thinner down puffy jacket or my bigger coat – it was in the 40’s through most of our trip, but got as low as the 30s in some areas, and up to the low 60s on the Amalfi Coast. I was worried that 5 outfits seemed a little low, but it was truly perfect. I wouldn’t recommend anything more! 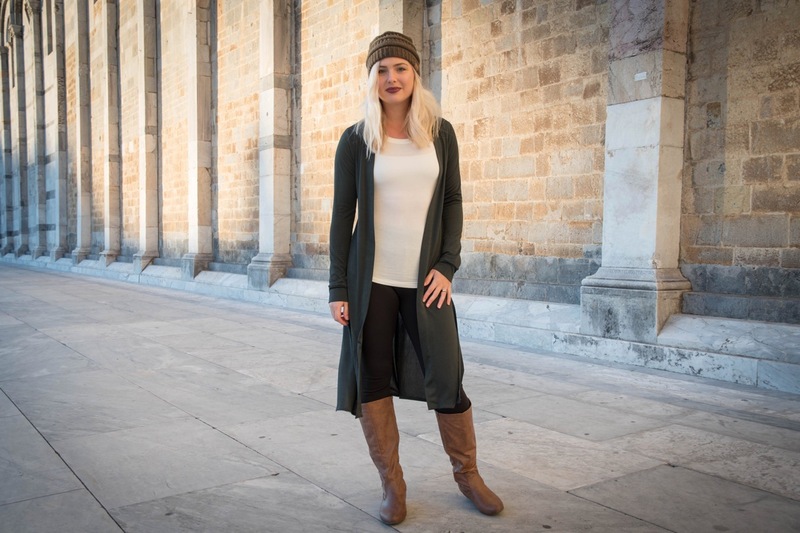 layered with a long-sleeve thermal in Pisa for some added warmth! We started in Venice, then travelled by train to Florence. We took a couple of day trips to Pisa and the Chianti Wine Region, and then moved on to Rome. From there, we took a train to Naples, mostly for its’ ease of access to Pompeii (which was incredible). We spent our last week on the Amalfi Coast, with a couple of final days in Rome. We did not stay anywhere more than 4 nights, but never felt rushed. We saw everything that we’d wanted to see, but truly could have stayed months and still not seen it all. Guess that means that this won’t be my last trip to Italy!! 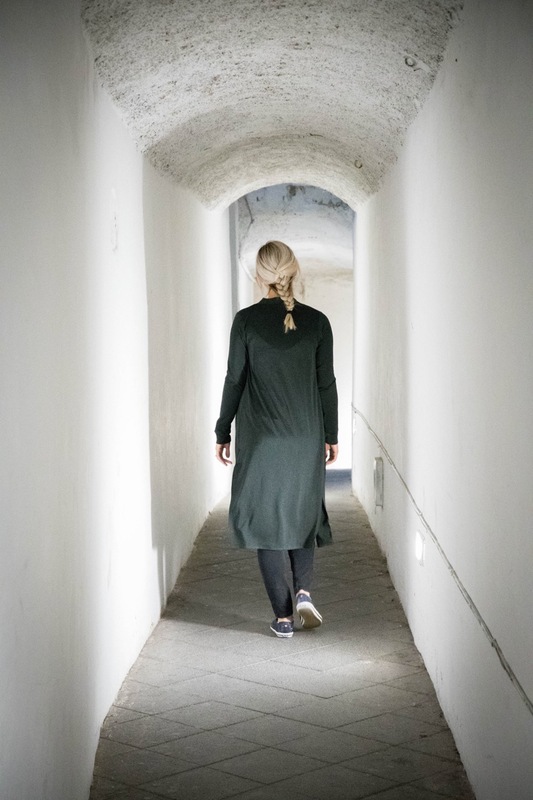 As this is primarily a sewing blog, I won’t go into more detail – instead, I will leave you with a few photos of my Blackwood Cardigan in Pisa and Amalfi! However, I could talk endlessly about my travels, so feel free to leave a comment below if you are interested in more! Now that the pictures have been edited and I’m settled back in after the holidays, I’ll be planning to have another post up soon about my other two (unblogged) handmade garments I brought along on our trip! Until then, enjoy the photos! If you haven’t made a Blackwood Cardigan yet, I found it to be a wonderful project with great instructions – thanks Helen! I’d highly recommend it, and she’s done a full sew along for the standard version, as well as a tutorial on her blog about how to get this extended length, split hem look. I’ve worn mine quite a bit this sweater season, it is soft and comfortable yet feels quite chic. Also, don’t forget to join up with #SewMyStyle2018! We’re well into January, but it isn’t too late to sew up a Sunny Dress before the end of the month (though unfortunately, the deadline for the Sunny Dress discount has passed. If you get in and signed up HERE before the 23rd, though, you will be eligible for February’s discounts!). Mine didn’t take much time at all, and I’m super excited to show you guys. I’ll be posting my take on it here, with my opinion on the pattern, on the final reveal day / the last Sunday of the month – January 28th! So far, I’ve loved seeing what everyone else has been making – the pattern is fairly simple, so fabric choice and hacks have led to quite an array of styles! Here’s to a year of great sewing (and hopefully more great travels)!! Lovely post, Italy looks amazing! Maybe someday I will get there! I highly recommend it! I can’t wait to go back! It has been perfect! Thanks for such a great pattern – I’m looking forward to trying more of your designs really soon! Beautiful photos!! A blog about the rest of your trip would be great. My husband and I are traveling to London and Paris in Sept and I want to bring a me made wordrobe and I’m trying to figure out where to start! I’ll try to write a bit more – I’m always happy to talk about Italy, if it isn’t boring everyone!! Beautiful, and what a perfect backdrop for your handmades! My husband and I got to honeymoon mostly in Perugia but we also went to Venice, Milan and Rome. Italy is such a beautiful country. I can relate with the heavy walking days. I bought a pair of Danskos for the trip and despite what the shoe store people told me, my feet were dead after a couple of several mile days in them! I’d love to go back! Oh my goodness – that sounds miserable! My Keds were SUPER comfortable and sensible, but the boots almost have holes worn through the soles, and the heels were entirely ground off! They were NOT made for walking!! Love it! We did an almost identical trip in September (Venice, Florence, Amalfi, Rome over 2 weeks) and the best decision we made was only taking carry ons suitcases and a small backpack. I really enjoyed sewing a few specific items for our trip. I love the dark green of your cardigan! It looks like it matched everything you brought perfectly! How was the weather in September? I imagine if it had been just a bit warmer, we’d have been able to pack even lighter. As it was, I was happy with our haul! I love that you were able to focus on sewing specifically for your trip, you’ll always have such special memories associated with those items!! I enjoyed your post and just started the Blackwood for my trip to Italy in the spring! Thanks for the info on the number of outfits! Five it is! I am limited to 17 pounds so packing is going to be fun. A piece like the Blackwood will be very versatile!